Hooray the asparagus season is in full swing. One of the highlights of my year (she obviously doesn’t get out much I hear you say). Anyway, I wanted to pass on to you this terrific starter or light lunch recipe (going a bit far calling it a recipe really). 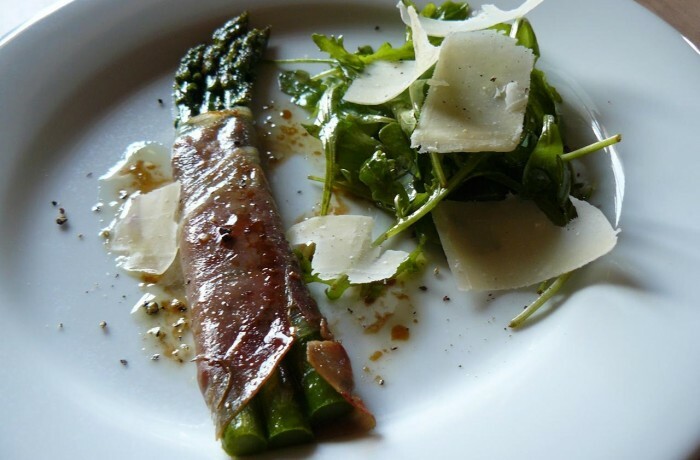 For a starter allow 3 asparagus spears per person or for a light lunch double that or even treble it if you’re hungry. Bring a large pan of salted water to the boil and drop them in for 1-2 minutes, just until they have lost their bite. Don’t overdo it as you’ll overcook them later. Refresh in very cold water (throw in a few ice cubes if you have them). Drain them on kitchen roll and then wrap each 3 spears in a slice of cured ham – parma, serrano, any local ham will do. You can prepare up to this point in advance. 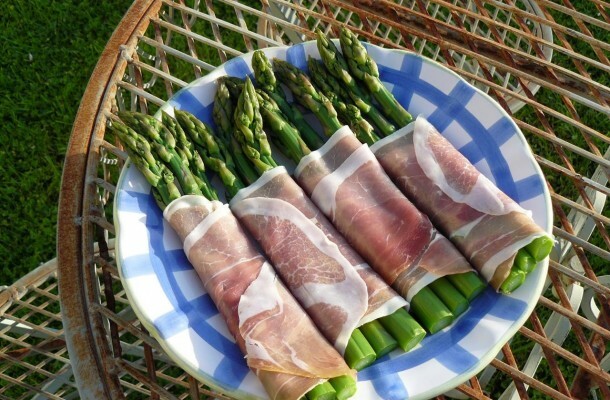 When you’re ready to eat, heat up a couple of tablespoons of decent olive oil in a pan, put in the ham wrapped asparagus and fry until the ham is golden on both sides. This takes just a couple of minutes. Deglaze the pan by adding a spoon of good balsamic and then remove from the heat. Serve alongside a few dressed roquette leaves and some shavings of parmesan. Voila! How easy is that?